Operating era: 1939-1951. Modern Version with Single Deck, No Side or End Fascias for LA&SL. 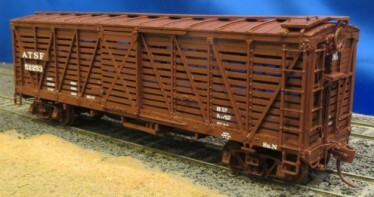 This Kit Series is the S-40-1 Pressed Steel Underframe Stock Car for the Union Pacific and subsidiaries Oregon Short Line (OSL) and Los Angeles & Salt Lake (LA&SL). These 36 foot, 6 inch fishbelly side frame cars, sometimes referred to as Harriman Standard design cars, were built in 1905. The pressed steel underframe was first developed by the Pressed Steel Car Co with the Harriman mechanical design department developing theirs concurrently. They were originally lettered for the UP subsidiaries with OSL getting 300 and LA&SL getting 193. The Stock cars had four distinct periods of existence, all modeled by our Kit versions. The original version, 1905-1913, was without end or left of side grab irons or steps and had a large fascia on the sides and ends. The safety appliance version ,1913-1925, had all steps and grabs added per the Safety Appliance Act. 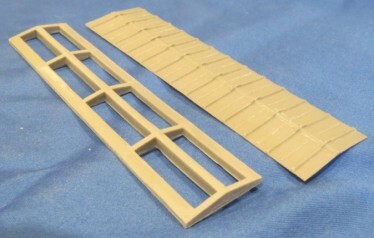 This version retained the large fascia on the sides and ends. The UP added side lettering placards also. The rebuilt version, 1925-1939, had the end fascia removed, the side fascia cut down to match the top of the side doors, and a side placard added for the “Union Pacific” spelled out. The roof grab configuration was also changed. The modern version, 1939-1951, had all side fascia removed and the lettering changed to UP gothic.